This tutorial contains instructions to resolve the following problem, when you try to join a Windows based computer to an existing domain: "The Specified Domain Either Does Not Exist or Could Not Be Contacted". The error "The Specified Domain Either Does Not Exist or Could Not Be Contacted" commonly occurs due to invalid DNS settings on the workstation's side, because Active directory requires you to use domain DNS to work properly (and not router's address). How to fix: Specified Domain Does Not Exist or Could Not Be Contacted. 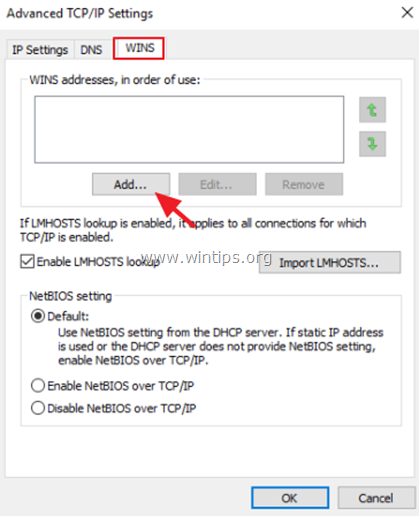 Let's suppose that your Active Directory Domain Controller (and DNS Server) is a Windows Server 2016 machine and is responsible for the domain "wintips.local" and has the IP Address "192.168.1.10". At this example, the IP and the Preferred DNS address on the Primary Domain Controller (Server 2016) must be the same, e.g. 2. Right click on Local Area Connection and click Properties. 3. Double click on Internet Protocol TCP/IPv4. 4. 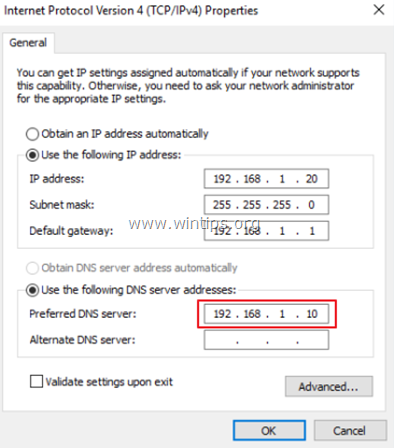 Change the Preferred DNS server address to match the Primary Domain Controller's IP Address (e.g. "192.168.1.10" in this example). 6. Click OK twice and close all windows. 7. Try to join the workstation in the Domain. Method 2. 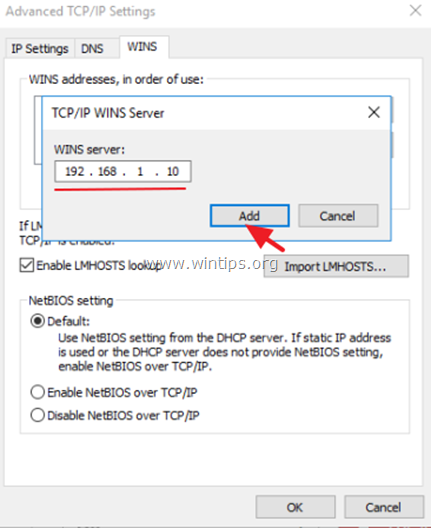 Specify the WINS Server's IP Address on Client. * Note: This method works even when the Primary Domain Controller does not act as a WINS Server. 5. At WINS tab, click Add. 6. Type at WINS Server's IP Address filed, the IP address of the WINS server (e.g. "192.168.1.10" in this example) and click Add. 7. Press OK three (3) times to apply changes and close all windows. 8. Try to join the machine in the Domain. « FIX: Error 0x8007025D Windows Setup Failed (Windows 10/8/7)	» FIX: Windows 10 Installation Error 0x80070006. Windows cannot install required files.